March 09, 2018 / LBD "Nytetrayn"
At the start of the year, I put out a call to see if there was any interest in me doing some sort of a mailbag column here on The Mega Man Network. And sure enough, there was! Since putting the call out, things have gotten a little busier in my professional life, and I hoped that while I was working on that, some more letters might come in, but that doesn't seem to be the case, so here's what I've got. Maybe it will spur more on for future volumes? I hope so, as it would be a shame for Tabby's art there to go to waste. Any change (sic) to get the TMMN Podcast resurrected? Ah, which one? I figure you mean the one you named, but there was also the TMMN Megacast. In either case, the answer is pretty much the same. The folks who did those podcasts have long since moved on from the site to other things and new frontiers in their lives, and unless they're interested in coming back and reprising their roles, those will likely remain as they are. I wouldn't mind doing a podcast of some sort (Strangely enough, neither one ever had me on. Go figure. ), but I don't know the first thing about editing these things, so at the very least, I'd need help. If I did start a new podcast here, though, out of respect to what's come before, I'd be giving it a new name and doing my own thing. What do you think the 7 legendary weapons are? We know a few of them, but any thoughts about the others, or your opinions on them. If I'm understanding you, correctly, you're referring to the Ten Shining Weapons cited in the Mega Man Zero Official Complete Works? I'll admit, this one's been a bit of a puzzle for me, and it would be nice to get someone from Inti Creates to confirm. For those unfamiliar, these are weapons that were used by top-class Maverick Hunters over the course of the Maverick Wars. Known pieces include the X-Buster, Z-Saber, and each of the Four Guardians' weapons. Taken together, those number six weapons. That implies that maybe there were others, such as Axl, whose weapons might count towards the total, or maybe something we didn't see in Mega Man Zero's time (like the Z-Buster, not to be confused with the Buster Shot), but we don't know. However, if one wanted to consider each individual piece of the known members of the set -- two X-Busters (one on each arm), two Z-Sabers (as of Mega Man Zero, as seen in the image at right), Harpuia's two Sonic Blades, Fefnir's two Multiple Launchers, Leviathan's Frost Javelin, and Phantom's Dark Cross, that makes ten. And leaves poor Axl out to dry. This is something that should be brought up to Inti Creates sometime. Maybe I'll give it a shot by email, but if anyone sees them at a convention and has a chance, it might be a good idea to ask, since I doubt the series will be revisited any time soon. I only started playing Mega Man inconveniently at the beginning of its infamous gap. How did it feel to see new game announcements so frequently? I'm guessing you meant during the franchise's heyday throughout the early aughts, when we'd have multiple releases in a year? It was kind of neat. Things were happening often enough that the fandom pretty much flourished. If you weren't a fan of one series, there was often another that might be more up your alley. And being a Mega Man fan honestly felt more like a full-time kind of thing -- something was always happening, there was always something to look forward to, to discuss, and so on. The number of releases basically put other annual video game franchises like your Madden or Call of Duty to shame. And then there was the merchandise, like the MegaMan NT Warrior manga and anime, which just kept things always feeling "on" for a while. If it felt like we were being spoiled, well, compared to most other game franchises, we kinda were. That's part of why having it all just suddenly dry up and stop felt like such whiplash. We had this thing that was a constant in our lives, the way fans of a TV show or comic book just always have something coming, and it all just stopped. Which classic series games did you have the most hype for? Hm, from Classic? That's a tough one, and I'm going to answer with two, because they have the same reasoning behind them. The first was Mega Man 7. It had been a few years since Mega Man 6 on the Nintendo Entertainment System (NES), which had wrapped up the series nicely -- or would have, were it not for the "To be continued" tag at the very end. Of course, that could have just as easily referred to the Mega Man X series, which at the time had seemingly taken over along with Nintendo's new 16-bit console, the Super NES. For all any of us knew at the time, the days of Dr. Wily and Dr. Light (capsules notwithstanding) were done. It came as a surprise to see the cover of Diehard GameFan Volume 3, Issue 1 proclaiming on its cover that they had the "1st Pic: Mega Man 7!" (plus coverage of Mega Man X2 as well). Sure enough, they delivered on their promise -- no more, no less. Nestled at the bottom-right corner of page 143 was the image you see at right. No descriptions, no hype, no matter -- the pic was all I needed. Mega Man X was awesome, to be sure, but from this first shot, I was seeing the "Super Mega Man" that I had imagined when magazines began bouncing that title around years prior. The other one would, of course, be Mega Man 9. While there had been plenty of Mega Man games throughout the aughts, there hadn't been a new entry in the Classic series (barring ports and remakes) for 12 years, dwarfing the gap between Mega Man 6 and Mega Man 7 many, many times over. It took on an almost meme sort of status in the fandom, with frequent pranks and April Fool's jokes being centered around the announcement of a new entry in the Classic series. Then came rumors that were different than those that had come before it. There was this feeling like it might really be happening, and then it hit. Erico had received his copy of the August 2008 issue of Nintendo Power magazine just ahead of the official announcement, and while I was writing for Kombo at the time, I made sure both they and The Mega Man Network got to break the news online. It was so unbelievable at the time that some people even thought we were pulling a hoax of our own (and I think some people still thought it was fake, even after the official announcements), but this was the real deal, and excitement was through the roof. Which spinoff series were you most excited for and why? That's a really tough one. To be honest, I was usually more nervous than anything about a new Mega Man series! But I guess it depends on what point before release we talk about as well. Early on, Mega Man's historically had a tendency to initially turn me off when a new series is announced, and it usually came down to something aesthetic. 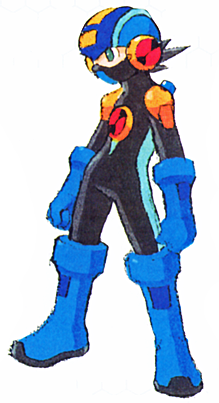 The image at right (from the September 1993 issue of GamePro magazine, courtesy of The Reploid Research Lavatory) shows one reason why: My first look at X (who we didn't even really know as a separate character from the original at the time) just didn't work for me. The eyes didn't look right to me, but more bothersome was the mask. "Mega Man doesn't wear a mask!" So I felt almost immediately alienated by this version of my hero who felt so unfamiliar outside of his color scheme. Makes me wonder how I'd have reacted had Zero actually been used as the main protagonist. Fortunately, Game Players magazine would turn things around, as their preview showed a more colorful, maskless version of X that we'd all come to know and love. The armor was still weird, but it was apparent that you'd be upgrading him gradually from something more like the Mega Man we all knew into this newer form, and I was more able to readily accept that, and the hype grew from there. I had initial doubts about Mega Man X, and I wound up loving it. I had initial doubts about Mega Man Legends, but fell in love with it after playing a Japanese demo at Microplay. And after that? Mega Man Battle Network, of course. I believe it was IGN who broke the story with this image gracing its article announcing the new series. I can't say I was impressed, and I think I was soon ready to just throw my hands up at this particular iteration, but then I remembered how Mega Man X and Mega Man Legends turned out, and decided I'd just wait and see. And, of course, I wound up being pleased with what we wound up getting. Since then, I've pretty much made a point of waiting and seeing how these things turn out, as there's usually more going on than we know from initial reveals. Good luck on the opening of your new column! Thanks! And even though this one only had three letters, you helped me fill it out quite a bit, so thanks again to you for that! Here's hoping there will be more to come in the future! And on that fitting note, if you've got a question you'd like me to answer, just drop a line to the.mega.man.network (at) gmail.com or use our tip submission form with the subject "Mega Mailbag," and maybe it'll appear in a future volume! Oh, and as I said before: "PLEASE do not submit something for the mailbag via comments or social media; at this stage, I feel like that would take a lot of the fun out of it and defeat the purpose, especially if it's something everyone else who sees it gets to comment on before I do. If it seems beneficial, I'll open that avenue up in the future, but for now, those will just be ignored (and those are harder to track than e-mail, besides)."